And then came mid 1980's when (rare but they did) pictures would pop up in publications showing "the other" Irish Setter. The one many called (and still do) the original Irish Setter....mainly a white body with red patches, some with a lot of patches and others with very few and small patches of red. My interest grew with each picture I would see, in the late 80's, early 90's I wrote to a few owners of the Irish Red & White Setter - collected myself more information and pictures and decided one day, although I would always have my REDS, that I would welcome a Red & White into my home. Joined the Red & White dog club and renewed my membership for a number of years until the time was right. 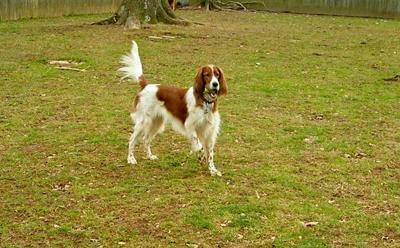 Last spring I had to say good by two my senior Rescue Irish Setters - Shane & Faith. My remaining Irish, Kylie was then 7 1/2 yrs old - I also had adopted a 5 yr old Irish through Rescue - so both my Reds were of an age that could handle a young dog. Didn't really think that young dog would be a 12 wk old puppy when she arrived BUT on one of the e-mail lists I kept watching as pictures of a litter, in Canada, were posted and once again fell in love with a face. This time a Red & White face.....Amazingly things worked out and Cassidy made the trip from Canada (overland) to Pennsylvania and my arms. Cass fit right in, she fell in love with my boy Mick and they have really been best buds - all 3 play toys together and just about everything together - Cassidy is now a year and a half old (01/12) and has remained much smaller than any of my Reds over the years - her feathering is now long, silky and beautiful - she can be a devil but then this is what SOLD me on Irish Setters - their devilish, carefree, silly way and zest for life at all ages. Hope to be owned by a few more Irish Rescue Reds in my remaining time on this great Earth, and maybe another Irish Red & White or two to keep things interesting. Carol in PA with Kylie, Mick and Cassidy. Alissa - you are just going to have to come back to visit and see all of the feathers, have a meal, set a spell (a longer spell). PS Cassie had the toy in her mouth and was watching the other yard. Pretty girl - last time I saw her she was working on getting her feathers! Gotta ask - is she setting a toy or another dog? LOL!!! I never tire of hearing wonderful love stories! You painted a lovely picture of your family, because everyone knows a home isn’t a home without a few dogs! It is admirable that you rescue setters in need. Hopefully your time on this earth will be unusually long since you are caring for God's other children. That's a beautiful story and a wonderful picture of your Cassidy Faith. I have always loved the look of an Irish Setter but have never owned one. For me it has been Collies (2), German Shepherds (3), Cockapoos (4), and our one and only Chocolate Labrador Retriever, Bailey. OK, I had a Dachshund when I was really little, but that doesn't count. He bit me in the face when I fell in his bed, so I try to forget that one. Thanks for sharing your experience and your love of these dogs!